Social media to change the Arab world? Probably not. It is without doubt that when people look back at the political events of the year 2011, the highlight of the year would be the civil revolutions and uprisings of the Arab world, or what is commonly refereed to as the 'Arab Spring'. 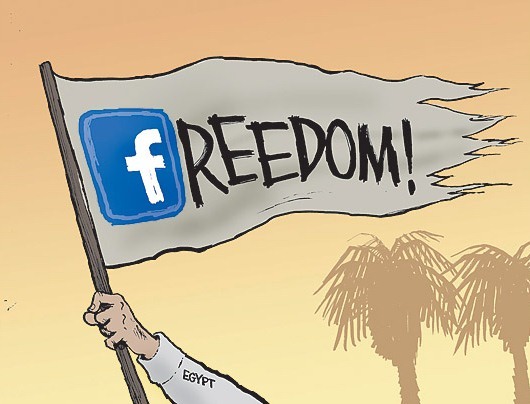 The Arab Spring has been associated with one of the most booming means of communication till now: Social Media. It is a common misconception, though, that the revolutions were caused by social media, since they would have started with or without the internet. However, what kept the revolutionary flame burning was the ability of citizens to easily and quickly share news, photos and videos of what is actually happening on the ground using social media. All reputable news sources were relying on amateurs to deliver the news. For the first time of the history of the Arab World, the news was made and delivered by citizens. Citizen journalism has never been so popular. And it is still going on. In Syria, where hundreds are being killed each week for voicing their opinions, everything is being documented. Yet, the excruciating power that the Syrian regime possesses is limiting the effective coverage. The Syrian government monitors every single move its citizens do on the internet. Any wrong move can lead instant execution or decapitation. Yet, there is great potential for social media in the Arab world. Users from around the world are using social media to free Palestine, to raise awareness about the Palestinian issue and to falsify rumors that the Western media spread about it. This is possibly the greatest Arab issue that can benefit from social media. Creating and broadcasting viral videos of the massacres the Israelis are implementing every day will reach those eyes that are blind-folded by the Western Zionist media. Yet, this is not being done effectively. The Arab governments and filthy rich princes and rulers should invest in seeding such campaigns instead of wasting their citizens money on buying themselves luxury cars and summer houses castles in Europe. Have you heard? The Arabs have built the first ATM machine that dispenses gold bars (more info). But they fail to utilize free or cheap services that can potentially change their lives to the better; services that help them communicate directly to their masses, create engaging channels to discover the real needs and wants of their population and eventually have a happier well-balanced community. There is not ONE politician in the Arab world that cares about improving the well-being of his/her country's citizens. Why would they care about what social media can help improve their lives? It is just one of those missed opportunities that pass by without them making the most of. Besides, why use something that can potentially uncover their scandalous secrets? In fact, I do have a pessimistic view of social media in the Arab world, not just in politics. In an era where technology is dominant, the Arabs are, as usual, behind in realizing the importance of social media. Governments, companies and even universities block or monitor these means of communication. PhD professors at universities mock their students for studying social media. Restaurants sue their customers over a bad review on their blogs (which they should take as an opportunity to improve instead). Parents yell at their children when they use the internet in their spare time. Media agencies abuse and exhaust social media to make profit of their clients' and customers' backs. Employees get fired for expressing legitimate opinions about topics unrelated to their jobs. Yes, the situation of social media in the Arab world is messed up, and it will continue to be. As long as books and intellectual material are getting banned from Arab countries for a stupid reasons, journalists getting kidnapped for expressing their values and beliefs, and citizens getting harassed because they tried to go against a government or a company, social media is the least of our worries. But that is not even the funny part. Last year, I was attending a conference in Lebanon that was discussing social media. All the speakers were 50+ year old filthy rich CEOs and princes who have never even experienced social media. They were discussing how important it is to the Arab world. Here comes the funny part: they were blaming the Arab youth for all the problems that we are facing. They claimed that our youth are lazy, have no initiative, and do not aspire to become better than the West. That was the biggest load of hypocrisy I have ever heard in my life. But I believe they have been proven wrong during all the uprisings that they witnessed while clutching to their chairs and hiding behind shadows of other governments. As I said, social media in the Arab world (as the case on most aspects) has a lot of potential and needs a great deal of improvement. But I fear, or more realistically, I know that things are not going to get better any time soon. It is true. The Arabs do not really deserve technology. All they will ever be is consumers of science, they will never contribute with anything useful for human kind again. The days of the Arab legacy will never come back. Even the regimes and politicians who will rise after this revolutions will not be better. They will be worse. Mark my words, they will rob the citizens even more. There's nothing like putting new poor people back in power. It's not that social media can't change the Arab world... but practically nothing can do. All the Arab ideology is pretty much set in stone, and Internet, the brainchild of the demonic West, is far from making a dent in that. That's rather very pessimstic,seeing how social meida did find its ways to prove its significance in the Arab world as a maker as well as bearer of news during the Arab spring,inspite of all the ignorant efforts to ignore it. They can't but attest to its presence now.